Even though China and Saint John are located at opposite ends of the world, the similarities between students are much closer to home. Rob Moir, an economics professor at the University of New Brunswick Saint John, is able to apply his own learnings from his recent time there to his classroom in Saint John. 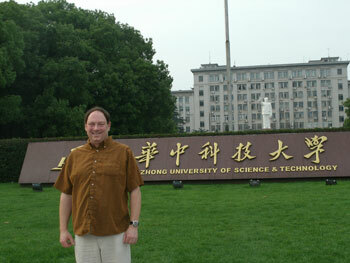 This spring, Moir was a visiting instructor at the Huazhong University of Science and Technology, a public, co-educational research university located in Wuhan, Hubei province, China. Teaching a course in international business to students with a major in English and Business Economics, Moir says the six weeks he spent in Wuhan was a great experience as he immersed himself totally in the campus community and culture. Moir also participated in group discussions outside of class where students had the opportunity to practice their English. With over 1,000 professors and 1,300 associate professors, Huazhong University is a huge campus with approximately 60,000 undergraduate students. "There were some challenges, but they were workable challenges in the classroom," says Moir. "Most of the students have been learning in English. So from a teaching perspective the language barrier wasn't a big issue." But he did have to find workaround solutions to some things. "I typically use a British game show as an example of business strategy on YouTube." However, China's ban on the popular site required using a similar video hosting site called Youku. Moir says he learned quickly that students from New Brunswick and China have a lot in common. “There was more of a generational gap, than a cultural one,” Moir jokes as he says the students text just as much as the students in New Brunswick! He is still in contact with some of the students he taught and hopes to have the opportunity to teach there again.